Meatballs: Whose Balls Are These? There’s been a lot of press about the opening of new Chinatown/Penn Quarter restaurant, Meatballs. Is this really a Michel Richard restaurant? Are the meatballs really going to live up to the restaurant’s name? In my opinion, yes and yes. This is Michel Richard’s third DC restaurant, and for my budget, the only one I’ll be able to frequent with any regularity. Citronelle (date night for the Obamas) and Central (lunch for the jet set) are still a little [or a lot] out of reach. But Meatballs, located at 7th and E Streets NW, serves excellent fare at reasonable prices. I was surprised that this is not a sit-down establishment. Not only are there not white tablecloths, but you order food at the counter, a la Chop’t or Chipotle. Choose your base (grinder, pasta, polenta), what kind of meatballs (traditional, Moroccan lamb, veggie), sauce (the morel mushroom sauce is by far the best), and free toppings. I was pleased to see that not only were mozzarella and provolone offered, but also the secret weapon of many a church potluck dish: Fritos. If you follow my advice and get the polenta, you will receive a side veggie included with the price (about $9-10). My steamed garlic spinach was wonderful. Let it never be said that Michel Richard is afraid of garlic. The polenta is absolutely creamy and moist, the perfect pillow on which to rest everything else I’d heaped on top. The Moroccan lamb meatballs are quite spicy, so I’d like to stick to the traditional. And the roasted red peppers and Fritos on top completed the dish (served in biodegradable bowls, which are easily fit with to-go lids). You’ll need that to-go lid too; one dish at Meatballs is easily two meals. All this is served up on a jellyroll pan, used as a tray. 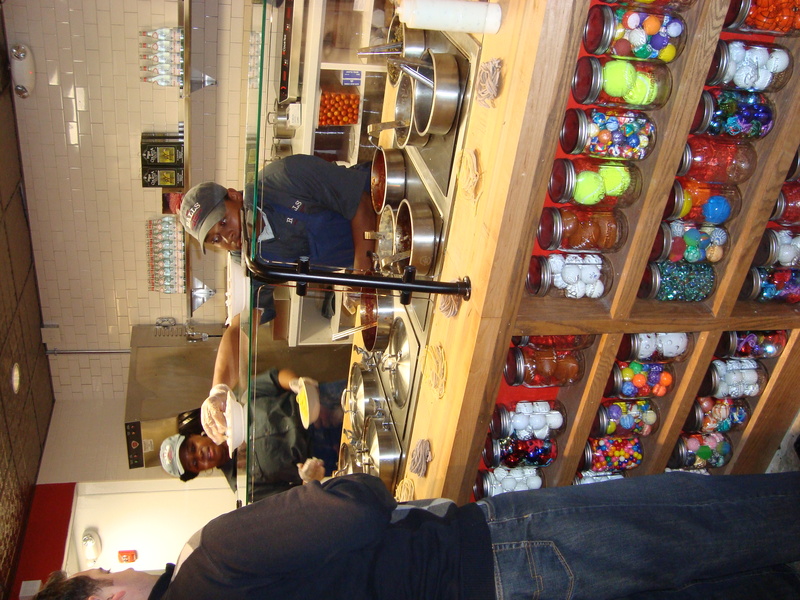 This last touch, as well as the meatball sauce-colored walls and the jars of other ball-like objects (marbles, gumballs) displayed at the counter, serves to reinforce the feeling of being absolutely comfortable. While they’ve only been open for two weeks, Meatballs has generated quite a bit of attention. The DC food blogs are all over this place, and as I sat, I saw many people come up out of the dark November night to peer in the windows. The prominent font placement might also have something to do with that. Whenever you’re in Chinatown or the Archives, stop by Meatballs. It is a delight, especially on a cold fall night. Ba boom. sounds great! i will have to check it out.